You are here: Home / Tea Leaf Reading / What’s at the Bottom of YOUR Teacup? We’re continuing with our study of how to read tea leaves. We’ve already covered the basic elements of tea leaf reading – what type of tea to use, what type of teacup and teapot to use, and how to make the tea. If you missed that article, you can read it here: The Art of Reading Tea Leaves. Now we’re going to go into the details of how to read tea leaves. Feel free to make yourself a cup and follow along as you read. The actual ritual of how to read tea leaves is quite simple. 1. You should drink the contents of your cup, leaving about a teaspoon of liquid in the cup. 2. Take the cup by the handle in your left hand and silently ask your question or ask for guidance about your future. 3. Swirl your cup three times in a counter-clockwise direction. 4. Carefully invert your cup over the saucer, leaving it there for about a minute so all the liquid can drain away. 5. Carefully turn your cup up the right way. The tea leaves are now ready to be read. It doesn’t matter whether there are many leaves left in the cup or just a few. Before you start the reading, allow your mind to relax. Quietly look at the tea leaves and tune into them. Tea leaf reading takes practice, so don’t be discouraged if this is challenging at first. Remember that everyone who learned how to read tea leaves had to start at the same place – the beginning. Everyone made mistakes before they mastered how to read tea leaves. Many people find it hard to make out shapes in the beginning. If this happens to you, simply turn the cup and see if it makes sense from a different angle. Don’t discount your initial impressions. They may give you information that you could easily overlook if you rush in to do an in-depth reading. Take your time to examine the shapes made by the tea leaves and how they are distributed around the cup. Allow yourself to remain calm and centered. Let go of any thoughts you have about the question or any answers you hope the tea leaves will give you. Don’t try to force the leaves to give you a yes/no answer, and look for shapes to match what you want. Let the tea leaves give you a true and honest reading. 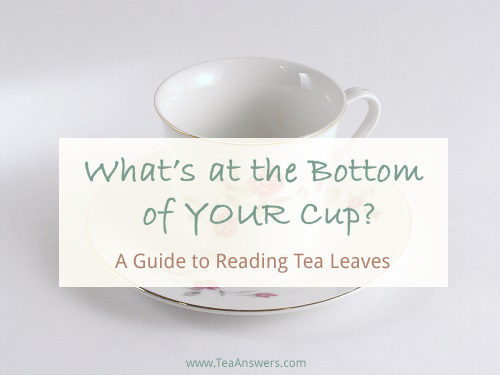 When you look into the teacup, do any shapes or groups of leaves catch your attention? Do any seem more important to you? What is your intuition trying to tell you? Example of how to read tea leaves: When I first learned to read tea leaves, I did a reading for myself in which there was a shape that caught my attention. It looked to me exactly like a for sale sign you’d see in front of a house. It didn’t match any traditional tea leaf reading symbols. However, my intuition told me that it meant I’d change my residence even though I had no intention of doing so at the time. Sure enough, I was soon presented with a job opportunity I couldn’t refuse, my house was sold, and I moved across the country. You will want to mentally divide the cup into sections in order to determine the time frame in which the different leaves belong. The handle represents you or the person who is receiving the reading. Traditionally, the tea leaves are read starting at the handle and moving clockwise around the cup. Any tea leaf shapes or groups that are close to the handle describe things presently effecting the person having the reading. It might indicate something on the person’s mind or events they are experiencing. Anything to the left of the handle is the past and is leaving the person’s life. Anything to the right of the handle is the present and immediate future. Symbols near the rim and the top third of the cup will occur quickly, usually within days. Symbols in the middle third of the cup are in the near future, usually a couple of weeks. The bottom third and base of the cup are in the more distant future, possibly a month away. In all three cases, the closer the symbols are to the handle, the sooner they will be occur. When you first look at the tea leaves, you will see the leaves scattered into lines, dots, and small and large groups. It will look meaningless and confusing. Pause and look at the different shapes from different positions, turning the cup to see it from different angles. The shapes and their meaning will start to become clear. In a reading, each shape is taken together. The good ones will balance out the bad ones. The good ones can be supported by other positive ones. The tea leaves will work together to create a story, each one filling in a different detail. Your job is to find the story. You will look at the different groups and shapes formed by the tea leaves to see if any of them form objects found in nature or elsewhere. It’s like when you were a child looking for shapes and pictures in the clouds. You might see a shape in the tea leaves that resembles a tree, flowers, anchors, stars, squares, letters, numbers, triangles, and so on. Each of these has a symbolic meaning. The symbols you see may be large or small. The larger they are generally indicates the more important they are. For example, suppose you saw the symbol of a bat – which usually represents a long journey. If the symbol is small, it might refer to going to the next town. If large, it might indicate a trip to another country. If you see letters, they often represent the name of a person. For example, the letter C will represent someone whose last name begins with the letter C. If the letter C appears next to a flying bird, it could indicate you will receive news from the person. It’s usually best to start with the largest shapes and work down to the smallest. The more shapes there are in a cup, the more the important phase of life the questioner is experiencing. Look to see if the shapes are spread out evenly throughout the cup or if they are concentrated in one of the sections. Keep a journal of your tea leaf readings. You may want to write things down as you go through your reading, noting both the shapes and your interpretation. The more details you add the better. You can then go back over your reading at a later time to see how accurate you were. Make notes of what did happen. See what you can learn to help you in future tea leaf readings. How Often Should You Read Tea Leaves? There’s no need to read the leaves in your teacup multiple times a day. You might start to confuse yourself about what you see, wondering if each cup is contradicting the previous. You could look in your cup every morning to see what the day will bring, or once a week for insight into the week ahead. Generally though, it’s best to wait to do a tea leaf reading until the events of the last reading have fully played out. You could look into your cup solely to ask specific questions, such as “Will I get a promotion at work?” or “Will my ex and I get back together?” However, both the tea drinker and the reader should concentrate solely on this question throughout the entire ritual and reading. But again, if you get an answer you don’t like, there’s no point in going back and repeatedly reading the tea leaves. Your readings will lose their accuracy and become muddled. You might start to misinterpret the tea leaves in an attempt to get the answer you want. It’s better to just trust the reading and see how events play out. I hope you enjoyed this article on how to read tea leaves as much as I did writing it. It really is a lot of fun to read tea leaves. I hope you will give it a try if you haven’t already.